oziehack - Game booster merupakan sebuah aplikasi yang dapat meningkatkan perfoma komputer kita ketika bermain game. 1 Click. Game Booster is extremely easy to use. 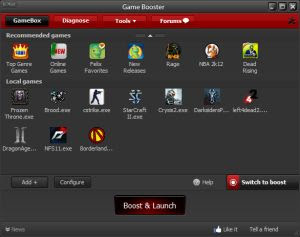 Its intuitive interface makes Game Booster the perfect tool for complete computer beginner. Speeds up Game Play. Game Booster gives more CPU and RAM to your games, making your games running at the peak performance. Defragments Game Files. Game Booster can quickly defragment game directories and files, to make your games load and run faster than ever. Increases Gaming Stability. Game Booster prevents and avoids possible conflicts and incompatibility, by temporarily closing background processes and unnecessary Windows services. Safe, Secure, and Free. Game Booster does not overclock your hardware, does not change your Windows Registry and system settings. Game Booster is 100% freeware, without any virus, adware, and spyware.